I did something yesterday I’ve never done before: cut pages out of a book. No, this wasn’t censorship; this was rendering Rick Steves’s guide to Amsterdam more portable. I couldn’t believe my visceral reaction against taking a knife to a book. And then, afterward, almost a feeling of relief—another deity bites the dust. But yesterday I spent the bulk of time thinking about what our panel is going to talk about at the conference next week. We gathered a few days ago—three out of five of us—on a conference call to begin getting to know one another. We have an exciting collection of people on the panel. From the Chickasaw Nation in Oklahoma comes writer Linda Hogan, who teaches humanities and whose novels, essays, stories, plays, and poetry have moved millions. I go to her small book of essays, Dwellings: A Spiritual History of the Living World (reissue Norton, 2007) whenever I want to feel more human—more alive, more in touch with the trees and flowers nearby. 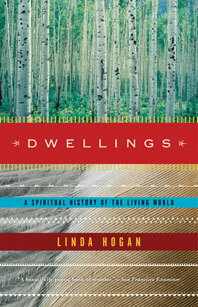 For some thoughtful words on Dwellings plus some choice quotes, see this review from the Lit Bit blog. From the Little Pine First Nation in Canada comes Shauneen Pete, former vice president of academics at the First Nations University in Regina, Saskatchewan. Shauneen is a longtime educator and scholar and a colleague of MJ Barrett, of the University of Saskatchewan. MJ and I met at the previous conference of this society eighteen months ago and have been talking on the phone regularly since then. The respondent for the panel will be Graham Harvey of the Open University in the UK, a Pagan and religious studies scholar whose book Animism: Respecting the Living World (Columbia Univ. Press, 2005) gave me words for the kind of spirituality I had been practicing for years. Our panel session is officially titled “Animism as a Path to Decolonizing the Academy.” It’s a formal way of saying that we regard the world as living and animate and that this way of relating to nature deeply challenges Western ways of knowing. We will talk as Indigenous and non-Indigenous scholars about what it is like from our differing cultural perspectives to engage in respectful, interpersonal relations with nature—what it is like for non-Indigenous scholars to break the great Western taboo against animism, and what it is like as Indigenous scholars to have one’s age-old cultural wisdom continually denigrated by the dominant culture. Actually, I don’t know what each of us will talk about. The three of us on the phone decided not to plan out in too much detail what will be said. As one Indigenous person observed, that would be going about it in the Western way. Instead, each of us will craft our presentations depending on what has already been said at the conference and what remains to be said. I expect there to be disagreements, challenges, and unanswered questions during our session. I wouldn’t be surprised if the discussion gets heated. I expect to feel vulnerable—I only recently “came out” as an animist in academic circles—and yet confident also in knowing that animism is a well-explored path toward ecological sustainability in some other cultures, if not in my own. Most of all, I look forward to the conversations. This conference draws scholars who are looking for better ways of relating to nature—and who are looking to educate others in better ways than Western culture now practices. If I am one of only a few Western academics who publicly calls myself an animist, I know there are many more who are sympathetic and who are looking for ways to also begin speaking about what they learn from the trees or the animals or the flowers. It is one of the painful ironies of such a conference that each of us who flies to Amsterdam will produce a carbon footprint in one day that is greater than what some people in the world produce in a year. And yet, here I go. Regarding the book slicing: I was faced with a similar dilemma when I went to Italy and didn’t want to tote along the entire Rick Steves guidebook. My solution was to photocopy the sections on Tuscany and the Cinque Terre. When I left those areas, I threw away the pages…but I still had the entire book waiting for me at home. Your conference sounds fascinating. I loved Linda Hogan’s books, and your panel should be exciting and lively. Good luck! !